Jacques Audiard’s The Sisters Brothers opens up with its many company credits appearing from the bottom of the screen and appearing upwards. It’s an off-kilter way to read them but absolutely fitting when what follows is a distinctly off-kilter western. 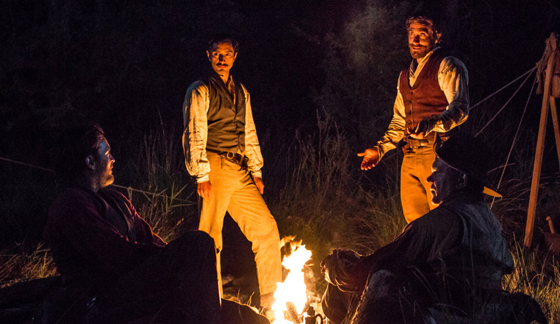 Set in 1851 during the US gold rush, Audiard’s film has all the pieces of a traditional western–the horses, the saloons, the canned beans– but through its four strong leads is able to explore so much more. 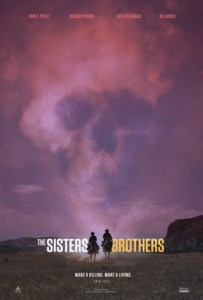 Ostensibly The Sisters Brothers is about Eli (Reilly) and Charlie (Phoenix) Sisters, a pair of assassins in the old west who are on a hit job on behalf of their wealthy client, the Commodore (a blink-and-you’ll-miss-him Rutger Hauer). The Commodore is after a gold seeker, Hermann Warm (Ahmed), whose chemical formula reveals gold just by pouring it into the water. A game changer for treasure hunters. Jake Gyllenhaal’s John Morris has been tailing Warm as he makes his way to San Francisco and leaving breadcrumbs for the Sisters to follow. Trouble is Hermann and Morris turn out to be oddly kindred spirits and Morris’s designs on Warm’s death start to wane. While Morris wrestles with his duties to the Sisters and Warm’s idealism, the Sisters cope with their own infighting. Eli is grasping at a world where they are free of needing to take on this dirty work to survive while Charlie can see no other purpose for himself than drinking and killing. The setup is relatively simple but in campfire chats and detours, mines a deep well of complex themes at play in this unforgiving environment. There’s an air of tragedy around all the leads that undercuts the masculine bravado that so often drives gunslingers in westerns. If there are John C Reilly-philes out there–and really, why wouldn’t there be?–these next couple months will be providing them with a wealth of his screen time. Obviously there’s the big Disney sequel with Ralph Breaks the Internet, the more familiar comedy pairing with Will Ferrell in Holmes and Watson and soon after that the UK will see him in the biopic Stan & Ollie. But I will go out on a limb and say that his work here for Jacques Audiard’s contains his most interesting performance of the bunch. As the older brother Eli, he is the more physically imposing presence of the two but continually reveals more and more layers of sensitivity as the film goes on. He has a token of a past romance in the form of a shawl he treats with reverence, he’s open to trying these newfangled tooth brushes that are going around. Most of all he carries the weight of having to take care of his damaged younger brother who would likely drink himself into oblivion without Eli nearby—not least of all because of their shared troubled childhood. It’s by far the quietest performance of the quartet but it’s extremely touching. The long and winding road that this small family unit takes is at every point unpredictable and where Audiard ultimately goes was unexpectedly affecting. A beautiful and unique entry into the genre.